case of foreigners), in reasonable health and good hold over the bike. - Copy of original Driver license. - Copy of original Address proof. - Passport size photo graphs. - Postdated check with amount equal to motorbike’s cost. - Copy of original Passport: Valid for at least 6 months past the intended period of stay in India. - Indian Tourist Visa: Citizens of several countries are now eligible for an e-Tourist Visa which can be obtained online. It is a single entry visa valid for 30 days stay. It should be obtained online before travelling to India. It can be applied for as late as 1 week before intended date of arrival in India (processing time: generally 36-48 hours). - 2 passport size photo graphs. The security deposit varies from INR 1000- INR 40000 depending on which bike model you choose. This sum is held as insurance for the damages to the bike that may incur during the journey. On your return, complete inspection of the motorbike is done by our mechanic. In case of no damages, complete sum in refunded back. – you return the bike on time with due notice. – you return the bike without any damage. – you return the bike without any missing parts. – the bike is reasonably clean. – there is more than half a tank of petrol left in the bike (if applicable). – we are not given enough notice that you wish to return the bike. – you do not inform us, atleast with 48 hours prior notice, that you wish to extend the rental period. – We reserve the right to approve or disapprove your request depending upon the further schedule bookings for the same bike. – In case of non-approved extension, rental will be charged twice of the daily rental. – the bike is damaged. – there are parts missing. – the bike is with a third party. – we are forced to collect any bike outside of working hours (10:00 am to 06:30 pm) or outside of the area that we accept to deliver to. – A delay of 30 minutes over the rental period is permissible for the return of possession. In the case of further delay or unapproved extension, the user must pay a fine of twice of the rental plus taxes (if applicable). The charges for the time period of delay will be calculated as per usual rates given on the website. 3.3. We will return the original deposit paid to us and will not allow for any difference in exchange rate nor pay any interest on the original deposit. If the deposit was paid via POS machine or any online mode, will be refunded via NEFT/Paytm/Cash Deposit (in case of Indian Nationals) and Paypal only (in case of Foreign Nationals). 3.4. In case of any major damages to the bike during your bike hire period, we will hold the deposit and cheque (if given) until all the repair work is done. Remaining balance will be refunded online via IMPS, NEFT or Paypal. After providing the final damages bill, you need to request for the refund within 7 days by sending your bank or Paypal account details through email. If we do not hear from you within the given time, your deposit will be forfeited and no refund will be made after that! You would be given a test ride before your journey begins. The purpose of this test ride is to get you acquainted with the bike. If you are not satisfied with the machine please point that out then and there itself. The mechanic will get the problem rectified. One of our employee will also give you mechanical training so as to explain about common parts of bike and the functioning. - Original/Xerox motorbike registration certificate, Third party insurance & Pollution under control certificate. Please visit our “Deals” page to find discounts. All the discounts or offers displayed on www.stoneheadbikes.com or any other partner websites can be avail at Delhi, Noida and Gurgaon centres only. Go to the “Rentals” page to select the available bikes. Select the pickup and drop off location as well as the dates you require the bike. To reserve a bike for you, 50% (applicable only for the pick up from Delhi, Gurgaon or Noida centres) of the total rental has to be paid in advance; the rest of the amount including security deposit shall be paid at the time of bike pickup. For other centres, 60-100 % (vary from city to city) advance payment is required to confirm your booking. No advance payment is required for walk-ins. Please ensure you choose an alternative vehicle, sometimes events beyond our control may make your first choice unavailable (e.g. breakdown or accident etc). We will make endeavour to ensure you receive your preferred choice. You can select the IInd preferred model within 10 days from the booking date else we hold the rights to upgrade your booking with any of the available models! Yes, now you can pick up and drop off the bike anywhere in India. The cost of transportation to and fro Delhi would be borne by the customer along with idle day’s rental. 9. How are rental rates calculated? Rental rates are based on 24 hours increments. If you pick up a bike at 10 AM it is due back on 10 AM the agreed upon day. Minimum of 3 days renting if hiring for outstation travel. All the rates mentioned on the website or sent via email is applicable only for minimum 3 days hire and for outstation travel only. For local use, you can hire the vehicle for less than 3 days as well but with the fixed 150 KM’s limit per day! Three days rental plus Rs. 5 per excess KM will be charged if exceeded then the fixed per day limit. Stoneheadbikes provides pickup and drop off facility within Delhi NCR location. This service is payable at an extra charge of INR 350 to INR 1000 depending on the location. This service will be free of charge if the location is within East Delhi. Pick up and dropping at your doorstep is available only for minimum 3 days hire. StoneheadBikes provides 24*7 online support. In case you face any issues with the bike please call our customer care number. We will try to resolve your problem on the phone and if not possible will redirect you to the nearest available repair shop. Road side assistance is available only with Royal Enfield Himalayan and other 2017 registered or above Royal Enfield models only. All deliveries and collections need to take place during working hours (10:00 am to 07:00 pm) if we are forced to collect any bike outside of these hours or from a third party we reserve the right to withhold the deposit. In case of delivery, final settlement will be done when we receive the bike at our workshop only. Security deposit will be refunded after deducting the damage expenses (if any) through NEFT or Paypal only. Only third party vehicle insurance is provided as is required under Indian regulations. This has very limited effect as you are travelling and if you cause an accident then no one is very interested in making insurance claims. The claim is made on the driver directly and usually in the form of cash compensation. Negotiate quickly and keep moving on your journey. Full attention to what you are doing is your best insurance. Comprehensive insurance is not generally available on most bike rentals. Medical and Accident/Travel Insurance, ensure that you have arranged all your travel insurance prior to departure as bike riding in India and some of the places that are popular can be difficult and things do happen. Full attention to what you are doing is your best insurance. A delay of 30 minutes over the rental period is permissible for the return of possession. In the case of further delay or unapproved extension, the user must pay a fine of twice of the rental plus taxes (if applicable). The charges for the time period of delay will be calculated as per usual rates given on the website. Mechanical warranty covers Tyres, entire electrical components including ignition switch, complete wiring, disk assembly, clutch plates and battery. – Mechanical warranty does not cover anything which is not mentioned in the inclusions. – Mechanical warranty is not applicable on the discounted rental! – Mechanical warranty is not applicable if bikes reserved through third party or our partner websites! – Mechanical warranty is not applicable if we found that the bike has been ridden negligently and without recommended routine check up’s and servicing. And also rider and pillion on a 350 or less CC bike is not recommended and warranty will not be applicable if we found that the issues has been occurred due to the overweight. - All confirmed rental reservations are non-refundable, unless specified under that of the Reservation Cancellation Protection guidelines (see below). No refunds on early returns. - No refund for cancellation of bookings post advance payment. - Stoneheadbikes has complete authority to cancel the booking without prior notice. – Sudden severe medical condition suffered by customer that prevents travel (certified medical doctor’s notice is required). – Pregnancy of customer (Doctor’s notice is required). – Death of customer, or immediate family member of customer (Spouse, Child, Brother, Sister, or Parent). Valid proof is required. – For pricing and more details, please speak to your account representative. If any booking is cancelled by Stoneheadbikes due to non availability, a full refund will be initiated. The refunded amount will reflect in the customer's bank account within 7-10 business days. To facilitate our clients, now we have partnership with selected and relaible vendors in Different cities as well. - When you book a bike with any of our vendors, they reserve it and keep it booked just for you. Upon cancellation from your end causes unnecessary inconvenience to the Dealer and a potential financial loss. Therefore there is no refund on already paid advance/rentals. - If the keys are lost and you require a set of replacement keys we can arrange for them to be sent to you. We will try to do this as quickly as we can but it will be at our convenience. We will also charge you 1000 INR + travel fare to provide a new set of keys. - In case of any en-route mechanical issue, you can call our mechanic at 919711037060 (Hindi) or 918800371553 (English) for any online support or assistance. You can also call us to check the spare parts or labor cost (if required). In case of any major fault, you can provide us your location to look for a nearest service station (if available). - Client has to to general checkup or service the hired vehicle after every 1000-1200 KM’s. Receipts from a licensed motor vehicle service center must be produced as the minimum evidence of servicing. Further penalties apply if it appears the bike and particularly the engine has suffered as a result of negligent servicing. And also 1550 INR (for Engine oil & service labor cost) + faulty parts cost will be deducted from the security deposit. In case of any reimbursement, the expense cost should be pre-approved by us and will be paid on your return and as per the actual cost only. - For all the new vehicles (2017-18) covered under mechanical warranty by the manufacturer, client has to service the vehicle as per the schedule mentioned in the vehicle manual and instructed by the manufacturer. Failed to do so will lapse the warranty of the vehicle and security deposit will not be refunded! - You are responsible for the daily maintenance of the bike during the period of hire, you are required to check oil levels, electrical, chain tension, tyre pressures, battery water levels, ensure that all nuts and bolts are tight. If the bike requires service or has issues then contact the name provided for servicing assistance. - In case of engine fault or failure, the customer needs to contact the vendor or customer support before getting any repairs done. The original printed invoice is mandatory to claim reimbursement for the same if applicable only. Please note if you have paid to fix the bike in a mechanic’s without letting us know or not letting us try to help you first, we will not be responsible for any charge that you claim. Failure to have problems attended to will only cause you more problems, more delay and more expense. The clutch, gearbox, brakes, cables and piston/rings can be subject to rider abuse when care and attention is not taken. In areas of high dust levels the brakes can wear quickly, as also the air filter will become clogged. Care and attention is required so that you keep moving forward on your journey. Please note that this is dependent on our schedule. We will help you as quickly as we can but we have to serve customers who have made a prior appointment first as a matter of general etiquette. - In the event of lost / stolen / written off bikes, please inform us as soon as you can and we will: report the missing bike to the police (if you wish to) consider the bike stolen if the police do not have it. estimate the bike’s current value once it is understood that the bike is stolen. You are then at liberty to check whether this is accurate or not. request you pay for the bike. We will then give you the bike’s registration papers so that you can claim the bike should the police find it. - If the police retrieve your bike, please inform us as soon as you can so that we can get it back for you. You will be responsible for any charges incurred which may include fines, storage, or transportation. - If you park the bike somewhere and lose the ticket, please inform us as soon as you can and we will help you get the bike. Please note that this is also very much dependent on our schedule. We will come as quickly as we can but we have to serve customers who have made an appointment before you. - We can collect bikes within normal working hours (10am – 06:30 pm). If you need to return the bike outside of these hours you will have to make an arrangement with us for you to deliver the bike to our shop yourself. - We do not accept for bikes to be left with third parties (as this can be very troublesome and time consuming) or to be expected to collect bikes immediately. We need 24hrs notice to be able to arrange to collect bikes and check for any damage. - If there is any damage to the bike we will withhold the deposit until repairs are done and expect you to pay any extra costs if these are greater than the deposit. - When returning the bike it is your responsibility to check carefully for any items left under the seat as once we have the bike we will not be held responsible for these items. - If you are leaving Delhi and your flight is scheduled outside our working hours we will require you to return the bike the day before your flight so that we are able to check the bike and return your deposit in full. You will be required to complete a number of documents and show originals of your documents. 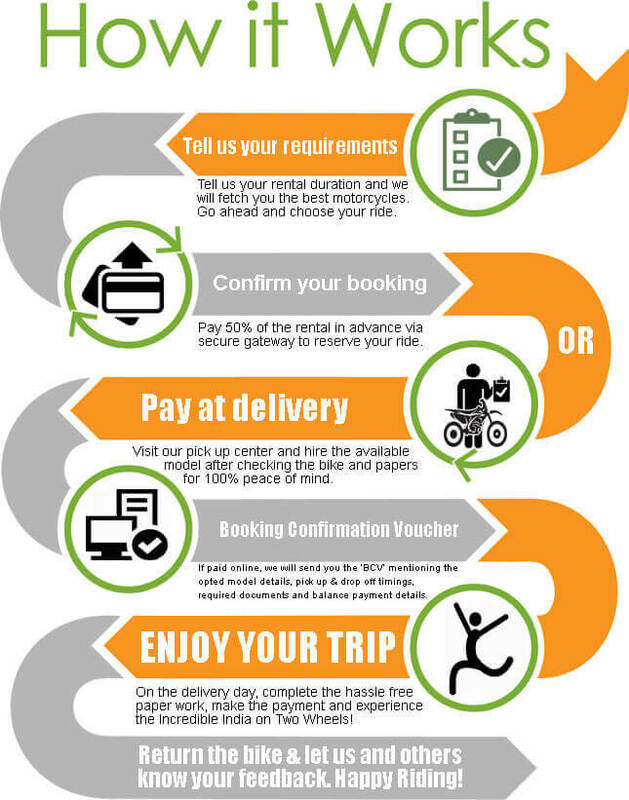 The process of the hire of the bike is explained to you. 22. Why you are signing a sale deed under buy back arrangement ? Reference Chapter V – Point 75 Scheme for Renting Motorcabs. use and for matters connected herewith. This gazette awaits formal promulgation, till which time we rent the bikes under a“ Sale Deed Under Buy Back Agreement “ where we sell you the bike on a temporarybasis, and on expiry of the rental period, buy it back from you by refunding the securitydeposit. Document of collection and responsibility of the bike, contract agreement for the purchase of the bike, receipt for the money paid. There is an additional legal buy back agreement to be signed, this document remains with the bike supplier for safe keeping as having this document on your person may create difficulties with you and the police. The agreement also spells out the terms for hiring the bike and if the bike is returned earlier than is agreed then you maybe charged at a higher rate for the whole rental period or have to pay for the remaining days of the agreed rental period. There are no refunds for the early return of bikes. The Terms and Conditions herein below form an integral part of the tour contract entered into between the Client and StoneheadBikes. However, any express Terms and Conditions set out in specific Tour Itineraries and Packages shall have precedence over the Terms and Conditions herein below. When making a booking with us, the client or travel agent needs to contact us enquiring the availability of the slots. On positive confirmation the client needs to make a deposit in order to book the slot in the tour. A confirmation invoice will be sent to you indicating the amount received and due amount. The balance needs to be paid no later than 45 days prior to departure. Failing which your booking shall deemed cancel. In such case there would be no refund of the deposit. - 25% deduction if cancelled 90 days in advance. - 60% deduction if cancelled 60 days in advance. - 80% deduction if cancelled 40 days in advance. - 90% deduction if cancelled 30 days in advance. - 100% deduction if cancelled less than 25 days or no show. The prices of the tours are fixed. Any bargain request will not be entertained. Discounts are available for groups of more than 10 persons.However, if due to factors like government taxes or fuel cost changes, the cost can vary. If the change is greater than 3% of the tour cost per person then the increase or decrease shall be passed on to the client. The accommodation provided is always in clean and tidy rooms. For luxury tours accommodation is provided in 4 or 5 star hotels. However for remote places like Sarchu, Pangong Lake, Sissu or desert places in Rajasthan accommodation is provided in deluxe or luxury camping tents. Note that we would provide accommodation in the best possible option for any location. For standard tours accommodation is provided in clean budget hotels or guest houses. StoneheadBikes shall be released from all obligations under the Tour Contract, if the Tour is cancelled on ground of Force Majeure i.e. exceptional and unforeseeable events and consequences thereof beyond the control and influence of StoneheadBikes and which could not have been avoided despite of due care, diligence and caution exercised by StoneheadBikes. Force Majeure includes but is not limited to floods, earthquakes, cyclones, other natural disasters, epidemics, strikes, war or situations similar to war, etc. StoneheadBikes reserve their right to change the itinerary or tour route which may include shortening, varying or re-routing the Tour without any prior intimation or notice on the ground of Force Majeure before or after the commencement of the Tour. StoneheadBikes will try to divert/modify the route in case of any natural calamity. In case the Participant chooses not to accept the alternative route offered to the Participant and not to participate in the tour, either on the same date or the alternative date, no other recompense will be offered from StoneheadBikes. In case StoneheadBikes cancels a Tour on the ground of Force Majeure, StoneheadBikes will try to offer an alternate Tour to the Participant. The client must be at least 21 years of age at the start of the tour. The client must possess a valid International Driving permit issued by the concerned authority in their respective country. The client must have at least 2 years of riding experience and must obey local traffic rules. Wearing of helmet is compulsory in India. The client understands and fully accepts the risk and responsibility for keeping their motorcycle under control and for selecting an appropriate speed during the ride. During the tour, the decision of the Program Director and/or the Road Captain will be final and binding by any means and in any regards. The Program schedule / route / mode of transport might be changed due to unforeseen circumstances or for the safety of the group; the decision of the Program Director and/or the Road Captain will be final & binding in this regard. The client must show reasonable care in the maintenance and driving of the Motorcycle issued to them. A security amount needs to be deposited per bike in lieu of the damages that the bike may incur during the tour. A full motorcycle checkup would be done on return. In case of no damages, full security amount would be returned. However, in case of major damages all the damages would be recovered from security deposit. The tour cost does not include any travel or other insurance. It is mandatory for the client to obtain insurance for riding a 500 cc motorcycle and other adventure activity (specific to your tour) for the entire duration of the tour.We cannot stress enough the importance of your taking out adequate holiday insurance against cancellation charges, unexpected curtailment of your holiday, medical expenses arising overseas, loss or damage to luggage and personal liability claims against you. Client would not be allowed to ride without a proper medical insurance for the type of motorcycle you are about to ride. In case of failure to obtain necessary and adequate insurance cover, then the Client undertakes to indemnify, both StoneheadBikes and their agents and representatives (as applicable) for any costs, charges or expenses that may arise and which would otherwise have been met had such insurance cover been taken out. Your specific passport and visa requirements, and other immigration requirements are your responsibility and you should confirm these with the relevant Embassies and/or Consulates. We do not accept responsibility if you cannot travel because you have not complied with any passport, visa or immigration requirements. If failure to obtain any such documents results in fines, surcharges or other financial penalty being imposed upon us then you shall reimburse us accordingly. StoneheadBikes shall not be held responsible for any accident, illness and loss of valuables or such other unforeseen events during the tour. In case any participant falls sick during the tour, the expenses for medical treatment, travel and porter charges etc. will be borne by the concerned individual. StoneheadBikes will not be responsible for any injuries or loss caused to any Participant or third parties through any occurrence as the result of failure, negligence, improper performance or behavior of either that or another Participant. By agreeing to this Terms & Conditions, the Participant accepts full responsibility of his/her safety &well-being. He/she would not hold StoneheadBikes or any of its representatives responsible for any loss / damage / injury caused. StoneheadBikes reserve the right, at their absolute discretion, to terminate any Participant’s tour arrangements, without any notice, should the Participant’s behavior be such that in StoneheadBikes opinion, it is likely to cause distress, damage, annoyance or danger to any other Participant /person; or, in case the Participant is physically incapable of completing the Tour or in case StoneheadBikes have concerns about the Participant’s medical condition. In such circumstances, StoneheadBikes shall not be liable to refund any amount or pay any compensation to the Participant. Excursions or other tours that you may choose to book or pay for while you are on holiday are not part of your package holiday provided by us. For any excursion or other tour that you book, your contract will be with the operator of the excursion or tour and not with us. We are not responsible for the provision of the excursion or tour, or for anything that happens during the course of its provision by the operator. Early Bird Offer on Leh Motorcycle Tour - Get flat 15% discount excluding taxes if booked on or before 15/10/18 for the tavel dates between 05/06/19 till 04/10/19. All the discounts or offers displayed on www.stoneheadbikes.com or any other partner websites can be avail at Delhi, Noida and Gurgaon centres only. All riders have to maintain proper decorum with other co-riders. StoneheadBikes reserves the right to use photographs or video taken by StoneheadBikes representative during the duration of the Tour for promotional activities on the website / marketing material. Once the itinerary has been formed, any request to change the route, accommodation will be subject to additional cost payable by the client. It is our endeavor to provide you the best servicein terms of food and accommodation. However StoneheadBikes does not own these establishments and would not be responsible if the service is not up to the mark. Clients are prohibited from the use of drugs during the tours. For more details, you can contact us by dialing 918800371553 or 919711037060. You can also write to info@stoneheadbikes.com.